Hi Friends, Hope you are enjoying Purchasing from Amazon. All of us know Amazon.com as well as Amazon.in. This post is created for those who didn’t know more about Amazon and information for applying Gift Vouchers. 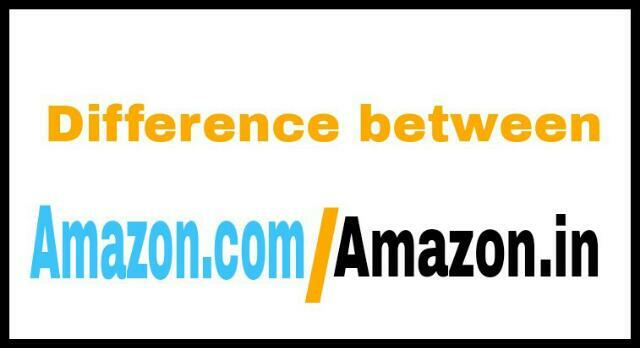 Single account is sufficient for both Amazon.com and Amazon.in. Amazon.com is mostly USA shoppers, although anyone can access .com and Amazon.in is India sellers and shoppers. There are probably a lot of Chinese sellers there also. USA sellers use pricing that they have to charge for postage, India sellers would use pricing they have to charge to ship in India. You need to look up what your postage costs are. If you are in India but want to sell on .com, then set your shipping settings with what you need to charge. No one can tell you what to charge. Look at your products and look at what it costs to ship. .com .in .uk .ru etc. are called country code top-level domain (ccTLD). There is virtually no difference between .com and .in If anything, .com specifies that it is an international commercial site and .in represents the Indian version of the same site, without any difference in content and its features.But in the case of Applying Gift Vouchers there is some difference. Amazon.in Gift Card balance recently known as Amazon Pay Balance.Amazon.com Gift Vouchers mostly in us dollars, so can’t add up with Amazon.in Gift Vouchers which is Indian rupee. We are Looting Amazon Vouchers from many apps. India Targeted apps Giving Amazon.in Gift Vouchers which is actually delivered by QwikCilver private limited company. International Targeted apps usually Gives Amazon.com Gift Vouchers which can’t add in Amazon.in, You will Get Some errors when trying to add them. So you need to Go to Amazon.com and Sign in with same details of Amazon.in and apply the Gift Voucher. You can only use Both Amazon.com Amazon.in Gift card balance separately. ie You can’t see your Amazon.in Gift card balance in Amazon.com and vice verca. If your Amazon Pay Balance is sufficient to buy a product, you cannot pay part of the item’s price using a gift card and the remaining using a different payment method. If you wish to save your Amazon Pay Balance for later, you can use other payment options to buy your product. To do this, uncheck the box next to Apply Amazon Pay Balance while choosing your payment method during the Checkout process. Amazon Pay balance (from the Gift Cards may only be redeemed) may only be used towards the purchase of eligible products on www.amazon.in. Purchases are deducted from the redeemer’s Amazon Pay balance. Any unused Amazon Pay balance will remain associated with the redeemer’s Amazon.in account and applied to purchases in order of earliest expiration date of the Gift Card. If a purchase exceeds the redeemer’s Amazon Pay balance, the remaining amount must be paid with by credit card, net banking or debit card. Amazon.in Gift Cards (“Gift Cards”) issued by QwikCilver Solutions Private Limited (“QwikCilver”). QwikCilver is a private limited company organized under the laws of India, and is the issuer of Gift Cards. By purchasing or using a Gift Card, you agree to and accept these terms and conditions. Amazon Pay balance is a sum of all balances associated with Gift Cards in your Amazon.in account.To Top-up your balance, you have to purchase a Gift Card (for a selected amount) that will be automatically added to your Amazon Pay balance.You may also purchase a Gift Card and send it as a gift by providing the necessary details of the recipient. – Gift Cards, including any unused Amazon Pay balances, expire one year from the date of issuance of the Gift Card. – Gift Cards may only be purchased in denominations ranging from Rs. 10 to Rs. 10,000, or such other limits as QwikCilver may determine. – Gift Cards cannot be used to purchase other gift cards. – Gift Cards cannot be reloaded, resold, transferred for value or redeemed for cash. – Unused Amazon Pay balances associated with an Amazon.in account may not be transferred to another Amazon.in account.